Ideaal voor Standards-based solutions and innovative technology enhance coverage. Easily integrated into existing networks and tailored to meet changing business needs to companies manage the increasing number of mobile devices while reducing security threats. Onderscheidend kenmerk The HP 501 Client Bridge bridges an Ethernet LAN segment with up to 15 devices, supporting a wide range of protocols to 802.11b/g/n or 802.11a/n/ac WLAN providing 802.1X PEAP authentication and up to WPA2 security without upgrading the clients. Voornaamste verkoopargument Enables a RS-232 asynchronous terminal device to communicate with compatible stations on the network with an integrated serial to TCP/IP converter. 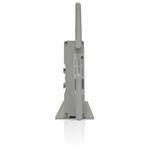 Voornaamste verkoopargument Improves wireless coverage areas and reception with optional outdoor MIMO antennas. Voornaamste verkoopargument It improves the performance of legacy wireless devices such as wireless medical equipment. Voornaamste verkoopargument Offers a Limited Lifetime Warranty. Voornaamste verkoopargument Offers high speed wireless connectivity with an internal dual band 802.11a/b/g/n radio for wirelessly transmitting and receiving data at up to 1.3 Gbps. Voornaamste verkoopargument Provides data integrity of wireless traffic with hardware accelerated encryption delivering high-performance with WPA2 and Advanced Encryption Standard (AES) security. Voornaamste verkoopargument The HPE 501 Wireless Client Bridge Series cost-effectively extends wired connectivity to hard to wire locations by linking multiple LAN segments via an access point. Voornaamste verkoopargument The HPE 501 Wireless Client Bridge Series links up to 15 Ethernet devices or an RS 232 serial device to a WLAN network, extending wireless access to legacy devices. Voornaamste verkoopargument The HPE 501 Wireless Client Bridge Series protects the network from intrusion with enterprise class layered security, including 802.1X support. Voornaamste verkoopargument The series offers Interoperability with an IEEE 802.11b/g/n or 802.11a/b/g/n/ac WLAN network infrastructure from Hewlett Packard Enterprise and other vendors. Wat is nieuw, pluspunt Fast roaming between access points. Wat is nieuw, pluspunt Integrates one dual-band 802.11ac MIMO radio running up to 1.3 Gbps. Wat is nieuw, pluspunt Limited Lifetime Warranty. Wat is nieuw, pluspunt Links up to 15 Ethernet devices or an RS232 serial device to a wireless network at Gigabit speeds. Wat is nieuw, pluspunt Support for IEEE 802.11b/g/n and 802.11a/b/g/n/ac WLAN networks.